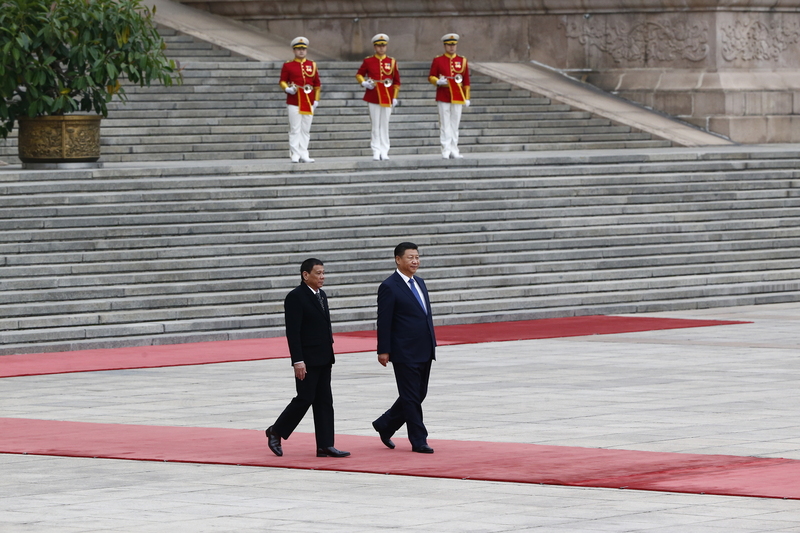 President of the Philippines Rodrigo Duterte (left) and Chinese President Xi Jinping (right) attend a welcoming ceremony at the Great Hall of the People, in Beijing, October 20, 2016. Duterte paid a four-day state visit to China, his first since taking power in late June, with the aim of improving bilaterial relations. How Many U.S. Allies Can China Turn? Richard J. Heydarian is a Manila-based academic and author of Asia’s New Battlefield: The USA, China and the Struggle for the Western Pacific (Zed Books, 2015). Rodrigo Duterte, President of the Philippines since June, visited China this week and signaled his interest in shifting Manila’s allegiance away from Washington toward Beijing. While his predecessor sued China in an international court to contest its expanded presence in the South China Sea (Beijing lost), Duterte, who has been ostentatious in his public derision of the United States, announced he would reopen direct talks with Beijing over the disputed waters. Is the U.S. about to lose a longstanding treaty ally? What is Beijing offering that makes Duterte’s posture worthwhile? Will other U.S. friends follow suit? And how should the U.S. respond? Philippine President Rodrigo Duterte’s China visit has caught worldwide attention due to its potentially transformative effect on not only China-Philippines relations but also the broader balance of the Asia Pacific. While it is hard to predict which other countries may also seek accommodation with China, the long-term trend does not bode well for Washington in terms both of balance of power and balance of influence in the region. To maintain a favorable balance in the region, the United States has initiated not only a “strategic rebalancing” but also has urged its allies and friends to step up their own balancing measures against China. For the latter, the U.S. needs a narrative that paints China as an aggressor. More importantly, the narrative needs a “victim” of China’s revisionism to highlight the needs for regional countries to boost their defense and seek closer ties with the Untied States. Indeed, if the Philippines and China could resolve their tension through a cooperative win-win formula, others in the same position, countries such as Vietnam, also may be motivated to forsake the balancing strategy and opt for accommodation with China. If so, Duterte could trigger a chain reaction that profoundly affects the regional balance in China’s favor. In fact, in the context of the Philippines’ foreign policy shift, Vietnam already is starting to improve relations with China. On August 30, Vietnam’s Defense Minister, General Ngô Xuân Lịch, paid a highly unusual visit to the mausoleum of Mao Zedong in Beijing and laid wreaths there. He stated that Vietnamese people never forget the “selfless” contributions that China rendered to their country’s war of independence. Then, on September 12, Vietnam’s Prime Minister Nguyễn Xuân Phúc, in his meeting with Chinese Premier Li Keqiang in Beijing, stated once again that Vietnam never forgets China’s massive assistance in the past. He also pledged that his country sees Sino-Vietnamese relations as the top priority of Vietnam’s foreign policy. It is highly likely that these Vietnamese “signaling” gestures were prompted by Duterte’s shift. Until Duterte, Hanoi and Manila had behaved like “allies” on the South China Sea issues. Duterte’s shift threatens to expose Vietnam to face China alone. In the long-term, the balance in the region may continue to shift in China’s favor. Duterte has stated explicitly that only China “has the resources” to help the Philippines to achieve genuine economic modernization. In fact, his wish list includes China building railways and improving infrastructures in the Philippines. He also wants to take part in Beijing’s One Belt, One Road initiative to reap economic benefits from China. This implies that Duterte’s China pivot is motivated in part by China’s rising material capabilities. After all, China, not the United States, now is the largest trading partner of every country in the region. Therefore, it is plausible that a continuously ascending China may trigger additional bandwangoning behaviors by countries in the region. As American political scientist Randall Schweller says, economic power is now the “daily currency of power.” In this context, U.S. military superiority and its alliances will not be sufficient to reverse the changing balance in the region and the decline of American primacy. First of all, I think we have to understand what is happening in the Philippines. So far, by all indications, what we are witnessing is a strategic recalibration, not total revolution in Philippine foreign policy. Despite his fiery rhetoric, and headline-grabbing remarks, Duterte is well aware that he can’t go Hugo Chavez: That is to say, jump from the American to the Chinese camp based on an anti-imperialist ideological project. In one survey after the other, the Philippines has come on top among the most pro-American nations on earth. There is a tremendous amount of good will among Filipino people towards America. More crucially, the Philippine security establishment is largely dependent on American full-spectrum military assistance, from logistics to intelligence, training, and financing, to fulfill its basic duties. What is more likely is that the Philippines will renegotiate certain parameters of security cooperation with America in exchange for economic incentives from and improved diplomatic ties with China. In the end, the Duterte administration may end up trying to balance between the two major powers, rather than siding with one against the other. Across the region, from Vietnam to Myanmar and South Korea, we have also seen the failure of China to translate its economic prowess into geopolitical acquiescence. While China’s neighbors welcome deeper engagement with Beijing, recent history shows that they will continue to hedge their bets by maintaining robust military ties with America. This is very clear in the case of Singapore, the most China-dependent economy in the region, which has progressively stepped up its security cooperation with America, which enjoys expanded access to the Changi naval port. We also see a similar move in (Chinese-majority) Taiwan, which is also stepping up its military cooperation with both America and Japan. So with few exceptions, it seems none of China’s neighbors is willing to throw its lot entirely in with the Asian juggernaut. They would rather balance and keep their options open. Hedging continues to be the regional norm, and I expect, ceteris paribus, the same thing with the Philippines. Nonetheless, when it comes to the Philippines it is important that Washington will adjust to the “new normal” in bilateral relations, whereby the new Filipino government no longer treats its relations with America as special and sacrosanct as before. America should be more forthcoming with its military commitments to the Philippines, stop equivocating on the coverage of its Mutual Defense Treaty with Manila (will it cover South China Sea disputes or not? ), and build bridges with the Duterte administration on its signature “war on drugs” policy. Instead of just criticizing Duterte, America should also assist in terms of intelligence cooperation (against organized crime groups) and provide aid for the creation of rehabilitation centers for hundreds of thousands of drugs users, who have surrendered to the government. Above all, America should get its own house in order after a messy election season, which has injected doubt into the robustness of American democratic and governance institutions. I would like to echo Professor Zhang Baohui’s observation on potential cascade effects in the region. The foreign policies of Southeast Asian countries are, quite clearly, influenced by more than what China and the U.S. have to offer. Arguably just as important is what they think other countries in the region will do. It’s not clear to me, however, whether such considerations necessarily push (or pushed) countries in one specific direction: Prior to Duterte’s recent moves, there were both first mover advantages (e.g., if you became China’s first ally in the region, then obviously that would carry greater benefits than being the fourth or fifth) and first mover disadvantages (the first to break ranks risked higher reputational sanctions from other countries) in effect. Now that Duterte has apparently made the first move, however, a different set of considerations come into play: Countries might decide that, because the “united front” vis-à-vis Chinese aggression has been broken, it makes more sense to take China’s economic gifts instead of fighting an increasingly lonely battle over territorial waters. Alternatively, they might think that sticking with the U.S. has never been more beneficial—now that the U.S. seems to be losing allies in the region, it will value those who remain much more highly. Vietnam, as Professor Zhang points out, seems to be following the former kind of logic—which makes sense, given its proximity to China and lack of deep ties to the U.S.—but others may very well choose the latter.